Take some sugar, and some malt (not too much mind), mash, boil etc and ferment. Add to the resulting watery brew some caramel for colouring and dodgy flavour, some 'hop extract' for bittering and dodgy flavour and stick it in a cask with a few bubbles. Sell at half 'market price' to euphemistically entitled 'community' pubs and sit back and enjoy the fruits of your labours. "Not just any beer: S&N (Heineken) beer." Apologies to our North American brethren who have no idea what utter bilge Courage Best is today in the UK. 'Best'? 'Best'? Utter shite more like. Trading standards have completely failed in allowing this tripe to pass for beverage let alone beer. I'd rather drink piss, really. Honestly. It isn't even funny. (Ok, it *is* funny, but I'm incensed by stuff). Stonch - get a cask in and lets see. Oh, sorry Ron, I know you weren't actually talking about this present day version but some uncontrollable inner rage spewed forth upon sight of that 'artwork' of a pumpclip you've put up. We are truly fortunate to be rid of S&N. In Edinburgh there is now the quite bizarre phenomenon of microbreweries creating clones of old McEwan's beers that S&N can't be bothered to brew any more. In the main they are excellent copies of beers which were terrible to begin with. Korev, not read anything about carbonation levels, but something like cask-conditioned beer would seem a good guess. Fatman, I had a couple of pints of Courage Best in Folkestone at the weekend. Didn't recall it being as horrible as you describe. But I did drinkk it at 23:30 after a day on the lash. 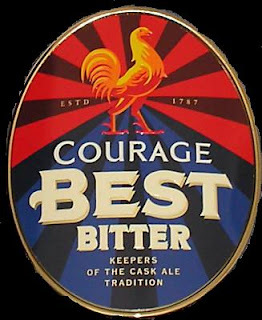 The 1915 Courage is conditioning in a cornie keg and will be brought online in a week or two. Anxious to see how it turns out but based on the hydrometer tube taste test it has potential to be a superb beer. The 1918 however is very interesting from a historical standpoint but I don't think I'll be brewing it soon. Maybe something from my new Durden Circle book. Now for my question. Was it typical for breweries to condition the kegs before delivery? I see conditioning times from days to months and I was curious who covered the inventory costs for this time period. First Stater, yes, casks were conditioned in the brewery. There were cellars especially for this purpose. Casks were not sent out to pubs until the beer was sready to drink. As tax was paid upfront, the brewery bore the direct cost. However, beers like Mild, ordinary Porter or Light Bitter wouldn't have had more than a couple of weeks consitioning at the brewery at most. I know this is a really old post but I have a question since I'm brewing this tomorrow night. You mention that the OG dropped to 1.034 but the logs posted show 1.049 (once converted). What is the OG and FG for the 1918 beer? I brewed 6 gallons of this today. I split the batch with wlp002 and wlp023.